﻿OK I blogged about this briefly before, but I must devote an entire post to this topic because it's shocking...to say the least. Ask Monica who has applied fake nails in the past. I used to be a terrible, beyond words, nail biter. It was no secret. I was terrible about it. My fingers were tiny little stubs. I had hideous hands. I'd get acrylics, keep them for sometime, and then I was back at it. Gross me. Somehow, Miss Ollie put things in perspective and I just quit biting my nails. Blame it on having real stress in my life. Perhaps it was all those prayers I made as a kid fearing no man would marry a nail biter like me - 16 years later the prayers were answered. This is the old nails. Terrible...I know. However, Aubrie was perfect! If a picture was ever being taken where I was aware of my hand in the picture - I'd tuck my fingers under. True story. I can't find a picture to show you this, but it's true. Here is my hand now. My real nails with clear polish!! My poor wedding ring won't fit over my man sized knuckle. Why do my hands go from a size 5 1/2 to a 7 when I'm pregnant? Seriously? I'm ready for my petite hand to come back. Oh and they are super red and dry because I wash wash wash wash wash all day long my hands. Then...I sanitize...and they burn. However they are uber clean. 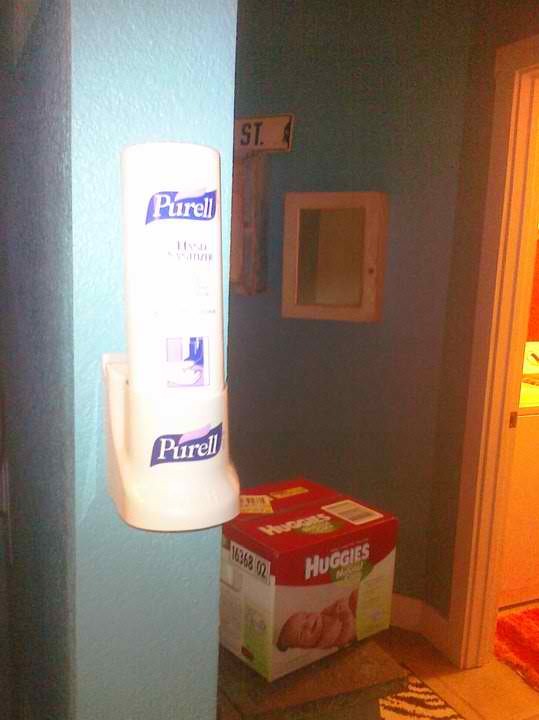 Oh and yes...Jade mounted a hospital grade sanitizer on our wall. That's how we roll. Germ free is the way to be...with an Ollie girl.